Home > Dog Beds > Why Does My Dog Do That? Chase cars, people, anything that moves? Why Does My Dog Do That? Chase cars, people, anything that moves? Filed under Dog Beds, Dog Behavior and Training, Dog Breeds, What is My Dog Thinking? We all wonder “why do dogs chase cars”! First let’s talk about a dog’s legendary desire to chase. Man has used dogs desire to chase to produce dogs that could herd sheep and cattle. These genes have been passed along to our pet dogs, and that trait is particularly strong in those that are decended from herding stock. 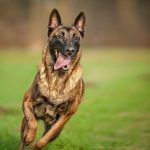 If this desire is not channeled into acceptable games with toys, dog can pick up many bad habits and get into a great deal of trouble for carrying out inappropriate chases. 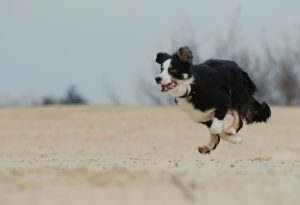 Border collies are among the best chasers in the world. This dog is excited by the man running past and gives chase. He is a friendly dog and his intentions is not the bite the man, but to catch up with him. However, some dogs will nip when they get close, especially if they are very excited by the chase or are scared of strangers. Since people can become scared or hurt by this behavior, it is essential to divert it into games with toys. Dogs chasing cars – I can run faster than you! Cars run away quickly and present the perfect chance for a good chase. 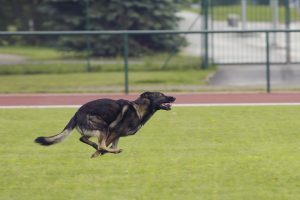 some dogs become so obsessed with car chasing that they will continue even after they have experienced an accident that leaves them seriously injured. This is a SERIOUS game to play, as both the dog and the people involved can easily be injured or killed. How can we stop dogs chasing cars? Here is an alternative. Dogs can learn to enjoy chasing the light beam of a flash light. The beam moves fast and erratically. Since dogs are more interested in chasing than catching, this can be a exciting and fulfilling game. A positive alternative to chasing cars! !